SASKATOON, Sept. 14, 2018 /CNW Telbec/ - Air Canada today unveiled its newest Maple Leaf Lounge at Saskatoon John G. Diefenbaker International Airport (Skyxe). The lounge seats up to 40 customers in an elegant space that showcases Canadian design and art, including work by two Saskatchewan artists, Shawn Evans and Holly Friesen. "We are excited to welcome Air Canada and Star Alliance eligible customers to our new Maple Leaf Lounge at Skyxe, which has been created to enhance the overall travel experience for our premium customers," said Andrew Yiu, Vice President, Product at Air Canada. "Showcasing contemporary Canadian design and artwork, and drawing on the pastoral landscape of Saskatchewan, the lounge is decorated with maple wood screen walls, Canadian-made furnishings and Canadian materials. Customers will be warmly received and enjoy a calm environment in which to work or relax before an Air Canada or Air Canada Express flight." "Skyxe is thrilled to welcome a new Air Canada Maple Leaf Lounge at Saskatoon Airport," said Stephen Maybury, President and CEO of Skyxe Saskatoon Airport. "This highly anticipated new lounge experience strongly complements our existing modern, comfortable and guest centric service offerings." "The award winning Skyxe continues to modernize and welcome the world to our city. The trusted brand of the Maple Leaf Lounge is a fantastic addition to what we offer here in our growing prairie community. Thank you to Air Canada for your commitment to Saskatoon," said Saskatoon Mayor Charlie Clark. "As one of Canada's fastest growing metropolitan centers, the opening of an Air Canada Maple Leaf lounge in Saskatoon speaks to the continued interest to invest in our city and confirms Saskatoon as a top destination in Canada," said Darla Lindbjerg, CEO of the Greater Saskatoon Chamber of Commerce. "With a sharp increase in arrivals into Saskatoon and strong projections for National and International travel, having a Maple Leaf Lounge at our award-winning John G. Diefenbaker International Airport is very exciting. Being able to offer visitors who are eligible customers an added amenity, will only add to their positive experience in Saskatoon," said Todd Brandt, President and CEO of Tourism Saskatoon. Air Canada and its regional partners operate over 110 weekly (17 daily) non-stop scheduled flights this summer from Saskatoon to seven destinations across Canada. It offers up to 1,320 seats departing the city, with up to six daily non-stop flights to Toronto, four to Calgary, three to Vancouver, two to Winnipeg, one to Edmonton, one to Regina and one from Ottawa. As a leading global carrier, Air Canada offers eligible customers access to 23 Maple Leaf Lounges worldwide including 17 at Canadian airports, plus lounges at New York-LaGuardia, New York-Newark, Los Angeles, London Heathrow, Frankfurt and Paris. 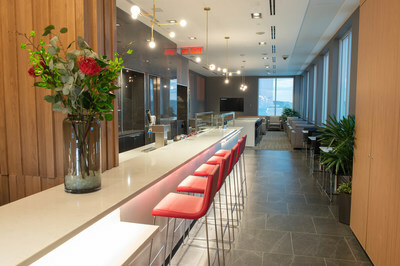 More information about Air Canada's award-winning Maple Leaf Lounges, including eligibility, is here. Skyxe Saskatoon Airport is operated by Saskatoon Airport Authority. Skyxe Saskatoon Airport is a partner in developing Saskatoon and Saskatchewan by delivering the most valued airport experience in Canada. Saskatoon Airport saw 1,463,410 passengers in 2017, the second busiest year ever with an average five-year growth rate of 2.1%.